I am excited about this sponsored post today! 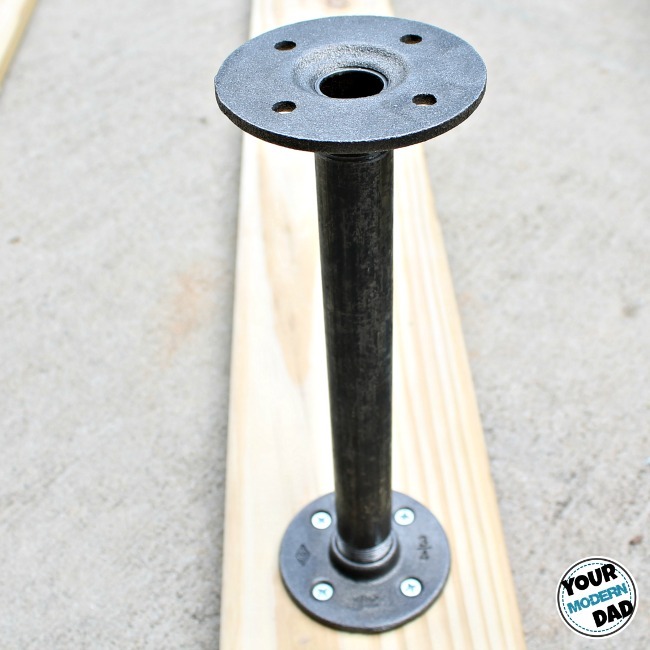 I built this plumbing leg shelf because it was simple and fun. 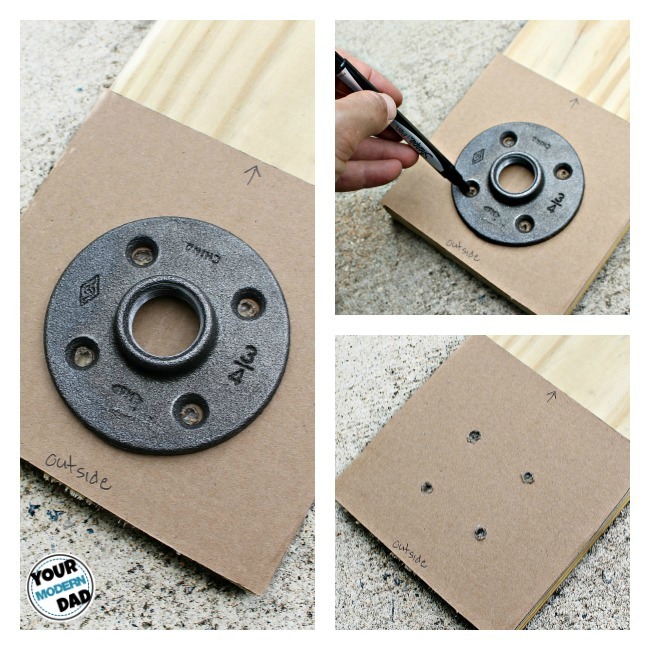 I love to do DIY projects with the kids! My son Beau is all about cars and anything related to cars. He loves the the design of them and most of all he loves the sounds of the engines. Over the last year, he has started to collect and build models. He is so proud of building them. He would tell me “Dad you know what would be cool, if I had a shelf or something I could put them on so no one could play with them.” After telling me this about 100 times I finally go the point. But what do I make that looks fits his room? After searching, I had the perfect idea. A plumbing leg shelf. 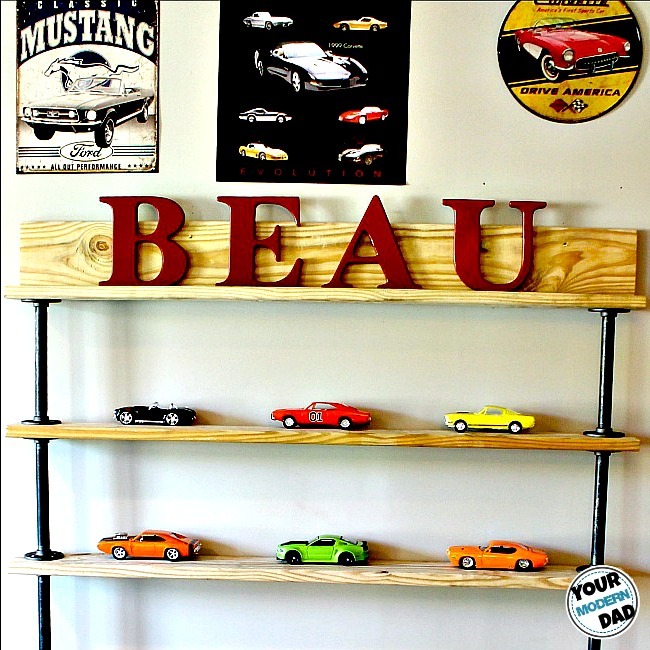 Beau has a lot of car related thing all over his room. I call it his little “garage.” So when building a shelf he needed something that was going to fit in. something that was a little industrial looking and very function-able. 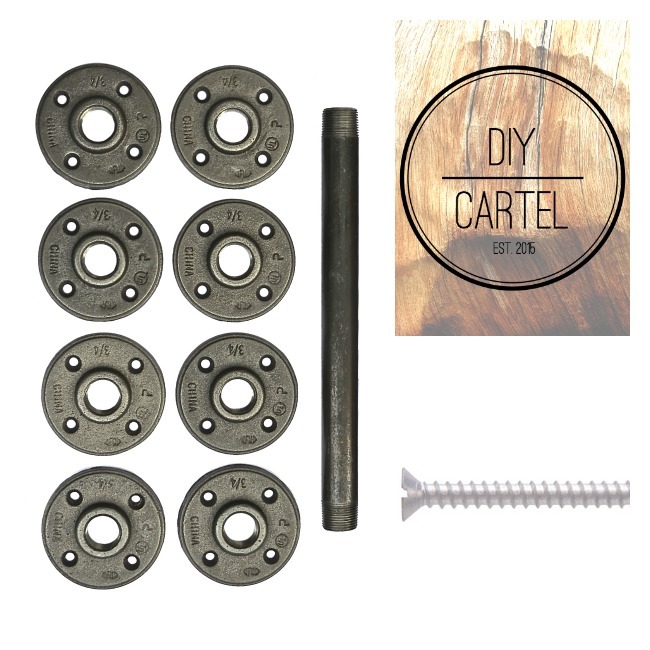 The plumbing legs set by DIY Cartel was a perfect solution for what I was looking for. First I went to to the local hardware store and purchased the wood for my shelves. (Tip: I purchased boards that were 12 ft and had store cut them to the size I needed, cheaper and cuts were exacted and all the same). Along with the wood, I purchased a wood screws. (As shown above, I used the #10 x 3/4 inch wood screws to make this shelf). Before I stared to assemble the shelf, I made a quick template out of some scrap cardboard. 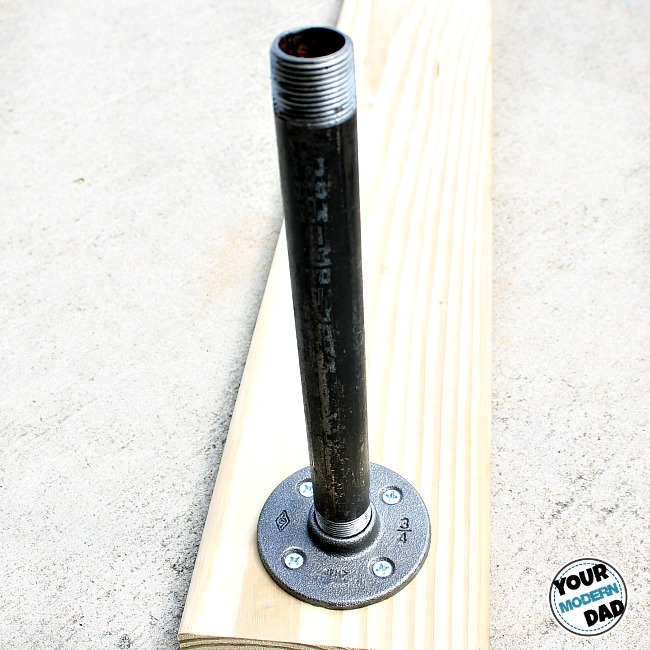 This is a great tip to help keep your plumbing legs in a perfect straight line. The template will be used on both side of the shelves, front and back. 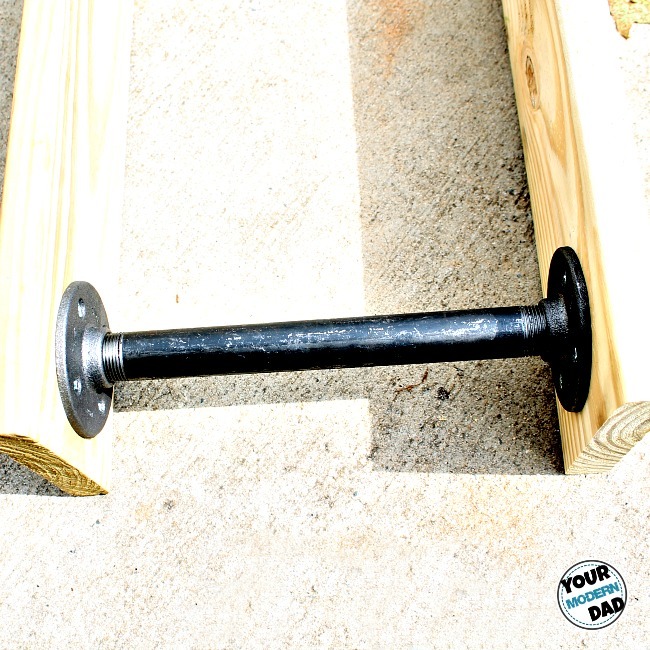 After you attach the first plumbing leg base on each side, you will need to screw in the plumbing legs to both sides. They easily screw in. Beau actually did this step for me, so it is so easy a 7 year old can do it. Once you attached the leg extension(s) to base, you are ready to attach that other end of the base as seen below. Once attached, you simply flip it over on your next shelf and screw in the base to the next shelf. 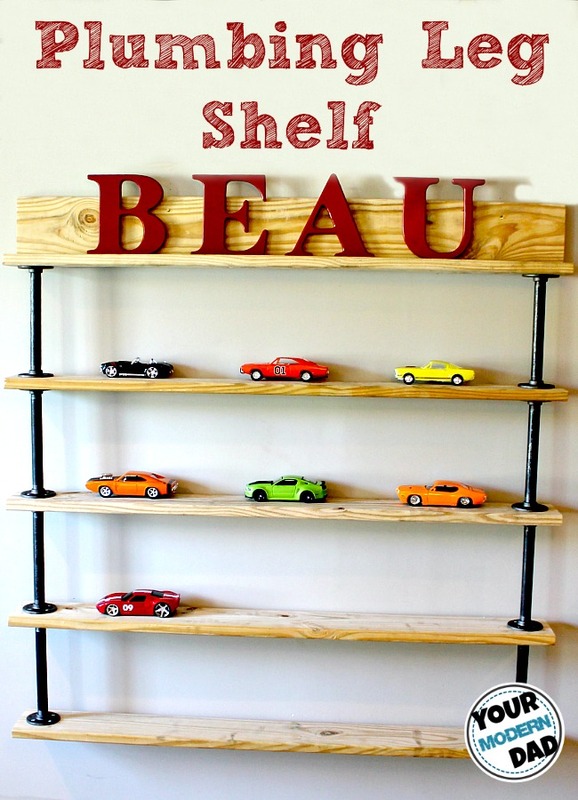 You will do this until you have the desired height of your shelf.